Rabbi of Salonica in the sixteenth and seventeenth centuries; died shortly before 1626. He was a pupil of Mordecai Matalon, and in his turn was the teacher of Ḥayyim Shabbethai. He was the author of various works both rabbinic and cabalistic, most of which were burned in the fire at Constantinople in 1606. Some of his responsa were published by his son Joseph Sason under the title "Torat Emet" (Venice, 1626). His text of agreements ("haskamot")for renting houses and other property is to be found in Abraham ha-Levi's "Ginnat Weradim" (part relative to the Ṭur Ḥoshen Mishpaṭ, No. 6). Shabbethai Bass ("Sifte Yeshenim," p. 80, No. 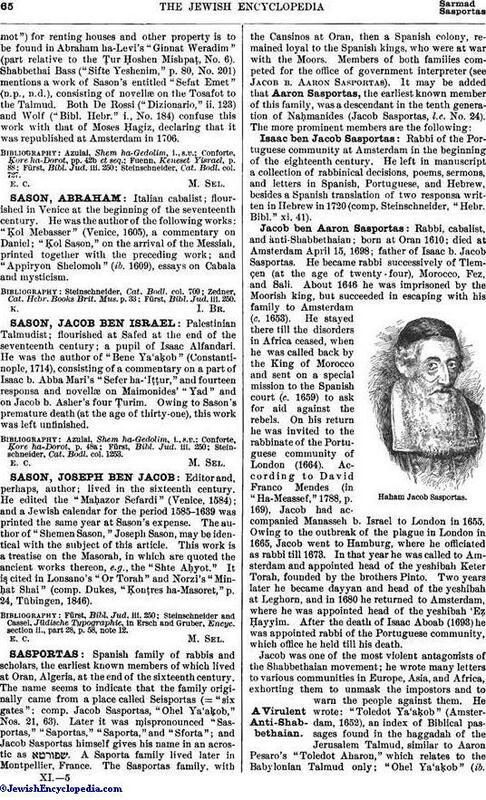 201) mentions a work of Sason's entitled "Sefat Emet" (n.p., n.d.), consisting of novellæ on the Tosafot to the Talmud. Both De Rossi ("Dizionario," ii. 123) and Wolf ("Bibl. Hebr." i., No. 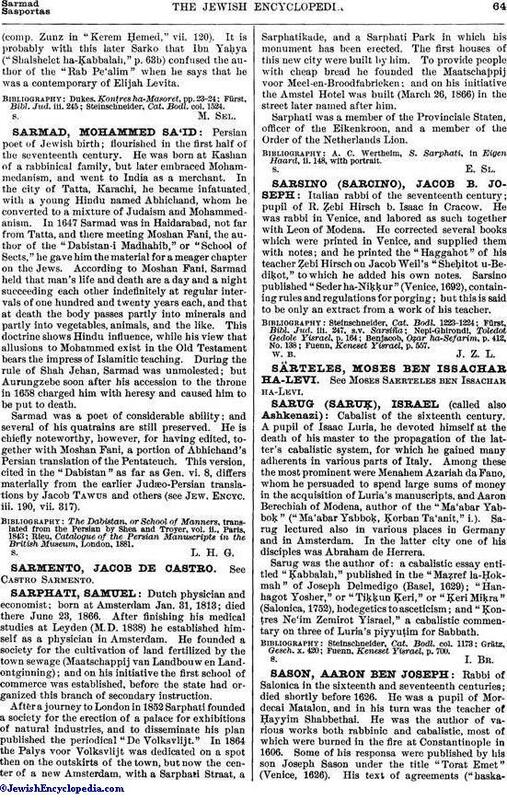 184) confuse this work with that of Moses Ḥagiz, declaring that it was republished at Amsterdam in 1706. Steinschneider, Cat. Bodl. col. 727.